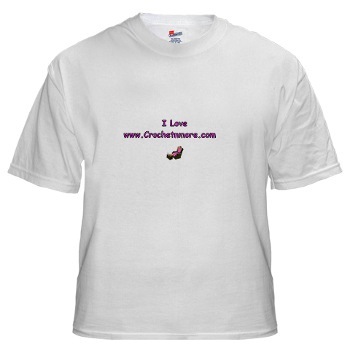 Thank you so much for your continued support of the Crochet 'N' More Newsletter and website. We thank God for giving us the ability and allowing us to share our free crochet patterns and information with you, all while being a witness for Him. We truly enjoy serving you and hope to be able to continue serving you in the new year. May this Christmas season bring you many happy memories of time spent with family and friends. Our daughter was eager to put up the Christmas tree on Thanksgiving weekend. She even requested that we play Christmas music and eat candy while doing so. Remember that the tiniest of things are noticed by your children and simple traditions mean more to them than you realize. I have searched and have not found any patterns that I think resemble what you're looking for. Do you have a photo of the afghan? Can you give me any additional information? If you can help Krista... post a reply to her request on the CNM Message Board. "Late on a sleepy, star-spangled night, those angels peeled back the sky just like you would tear open a sparkling Christmas present. Then, with light and joy pouring out of Heaven like water through a broken dam, they began to shout and sing the message that baby Jesus had been born. The world had a Savior! The angels called it "Good News," and it was." WHEN WE KNOW THE CHRIST OF CHRISTMAS." How old was Jesus when he was named? Correction in blue on Row 3. How do you do this? I know how to triple just not double triple. 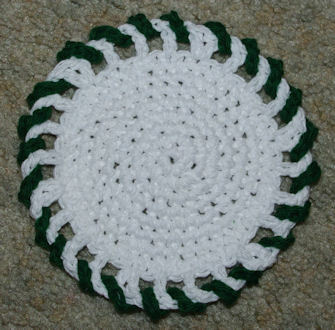 A Double Triple Crochet is also known as a Double Treble Crochet. 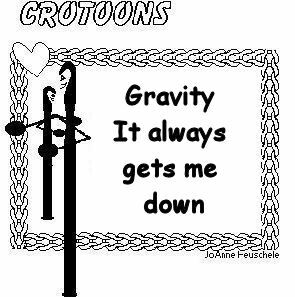 Yarn over three times, then insert your hook into the stitch or space indicated. Did you know you can join a new color yarn to a project using a double crochet? For instance, when making granny squares you can eliminate the slip stitch join and subsequent chain 3 to begin a new color round by joining the new color with a double crochet. Hi, I'm having trouble with reading a pattern I need help fast. Ch2*yo, insert hook in first DC, draw yarn through st, yo and through 2loops (loosely),repeat from*in each of the next 3sts (5loops on hook), then yo and through all 5loops, chain 1 for eye of inverted half shell, **ch 3, 1sc in next dc, ch 3, repeat from* in each of the next 9sts (10 loops on hook), then yo through all 10 loops, ch 1 for eye of shell, repeat from **across, ending draw yarn through 6loops on hook, ch 1 for eye of half shell, turn. I am lost, have tried the pattern but doesn't look right. now repeat the instructions from the asterisk in each of the next 3 stitches. you should have 5 loops on the hook. yarn over and draw through all 5 loops on the hook. now repeat from the asterisk in each of the next 9 stitches. you should have 10 loops on the hook. yarn over and draw through all 10 loops on the hook. chain 1 for the eye of the shell. Now repeat from the ** across ending with a yarn over and drawing through all 6 loops on the hook. chain 1 for the eye of the half shell. 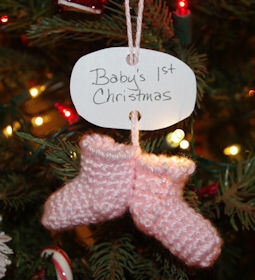 I practiced crocheting the newborn size ( I am a beginner) and it came out beautiful. Do you have the same pattern for a 4-5 month old? I'm so glad you enjoyed the pattern. I am fairly new to crocheting. 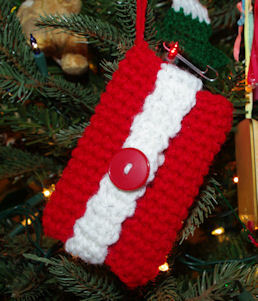 I'm crocheting your Christmas ornament bag. Why the "ch 5" on rows 3-24? The Chain 5 on each of rows 3-24 gives you spaces in which to weave the tie string when you finish. what does (3dc over the last dc made) mean. I believe this instruction is in the “Falling Leaves Afghan”, a/k/a “Crochet Autumn Leaves Afghan”. I have read one interpretation of this instruction online and it isn’t what I believe the designer wants you to do. I believe that “3dc over the last dc made” means to work those 3 double crochet stitches around the post of the last double crochet you made. This will make those 3 stitches lean. Hello. I was wondering how many crochet hooks this pouch would hold. BTW, I love all the miscellaneous item patterns. I'm still a semi-beginner & am looking for other projects other than beanies & scarves. average size hooks (G-H-I). I’m glad you are enjoying some of my patterns. Do you have a easy beginner hat pattern? Thanks. The pattern for Barb's Purple Hat is fairly easy. It is made from the brim to the top. Rd. 21....is ch.16 the nape of the dog? It seems awfully small... Is it because I'm using 3 wt. yarn? Once you make the 16 chains you join to the opposite end of the working row. The 16 chains plus the 40 half double crochet stitches make the circumference of the neck. I'm looking for a free pattern to crochet a buddy blanket. Thank you but It's a buddie blanket not a bunny blanket. I appreciate your input and will save it for a baby. I have a 5 yr old boy that wants a BUDDY blanket. I'm not sure what a Buddy Blanket is? There are tiny blankets like the bunny one that are referred to as a "lovey". Do you have a picture of a Buddy Blanket? It looks like a small crocheted blanket with a bear head and arms in the center. The arms look like they are holding down the bear. You are so nice to help with the search of a free pattern. Thank you. confused about instructions! 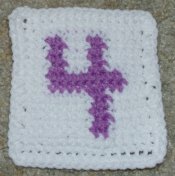 please help..on bonnie's cross bookmark, arms: row 3/says ch 4/1st ch 4 sp made/ is that suppose to join, somewhere? For Row 3 you make 4 chains (which will count as one ch4 space) Then go on to work 3 double crochets, one chain and 3 more double crochets all the next chain 1 space of the next shell. 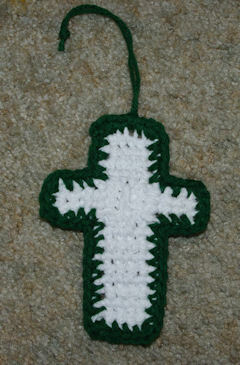 Rows 3, 4 and 5 comprise one "arm" of the cross. Each time you make 4 chains OR make a treble crochet you will be working along the side of one "arm". Hope this helps. 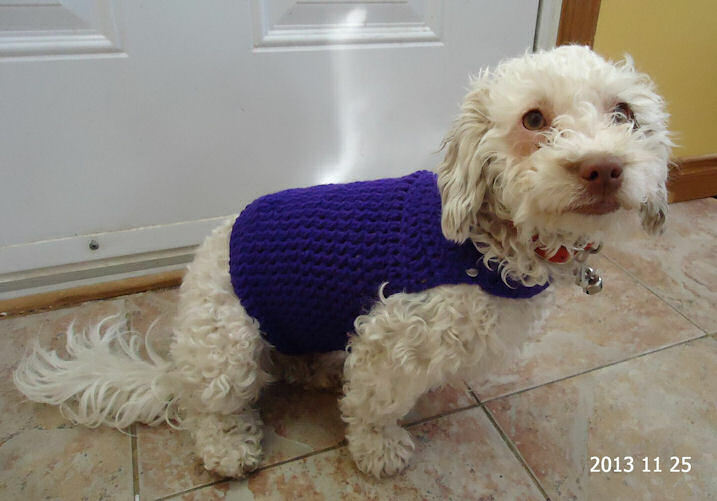 Here is a pic of my dog with your crochet pattern. Again, thank you for sharing. 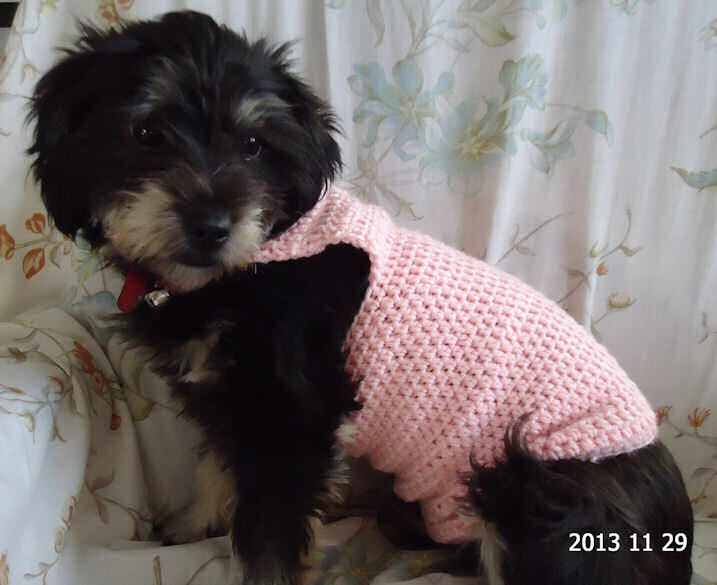 I'm making a pink one for another dog and I will send you a pick too. And a pic of my other dog Pixy Bear with her coat. She's a mix Yorkshire. Very sweet. Visit The Dog House to see more of our furry friends. Michael learned how to ride his bike without training wheels. "You know how you don't like me growing up? Well too bad. I just did!" Don nodded and said, "I think it would be a great Christmas gift." From the other side of the wall, they heard Kevin yell, "I don't want letters for Christmas!" for three-year-old, Maude to go up and talk to Santa, she became shy and wouldn't go. "Can you come get it?" Santa asked. Maude thought about this for a moment, then said, "Can you throw it?" were having in the apartment building where they lived. to hear the evidence...I'll hear the oldest first." When my son, Terrence, was four years old, he piqued everyone's interest when he placed a childishly wrapped package under thetree for each family member. On Christmas morning, Terrence looked on with joy and expectation as we opened his gifts. There were exclamations of "I thoughtI'd lost that!" and "So that's where that went!" When we asked Terrence why he had wrapped our favorite items, he replied, "Because I knew it was something you would really want!" One of our kindergarten students decided to see what would happen if he poked a pencil into his ear, and sure enough, the eraser end popped off and lodged in his ear. During the lengthy removal process, I was chatting with him to keep him still and asked, "Didn't your mother ever tell you to never put anything smaller than your elbow in your ear?" "Nope!" he replied. "My mom always says that with me, what goes in one ear always comes out the other!" spoke so quickly that I couldn't get a word in as he pressed home his sales pitch. Finally, after we'd seen all 20 poses, he asked me which ones I was most interested in. "None," I replied. "This isn't my child."